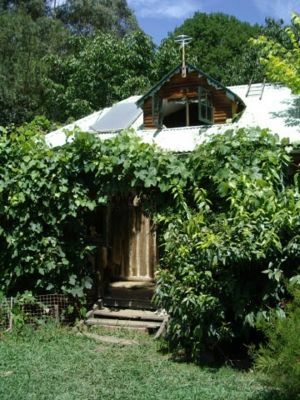 The Goongerah house is built from natural materials and has a solar array for power operating off the grid. The water wheel delivers water into the concrete header tank on the hill that feeds the domestic supply as well as the orchard, garden and stock troughs. The simple cast iron cooker/water heater/room heater uses much less wood than a large slow combustion heater would. It burns the wood cleaner and has a small firebox, meaning you don't need much to get the heat onto the hot plate above (unlike those deep fire box models that require a half tonne of wood in there before things heat up). This page was last modified 12:50, 13 May 2007. This page has been accessed 37,034 times.